Kudos to the men. I mean the men have really stepped up their game! Gone are the days where there were clear cut role dos and don’ts in marriages. Back in the days, a man couldn’t be caught dead sweeping the floor talkless of helping out in the kitchen. Kitchen duty was strictly for the women, house cleaning – God forbid, babysitting… stop jonzin woman! As I look outside my kitchen window, I notice my neighbour’s husband (a very seasoned Ibo man) sweeping the front of their apartment! For a moment, I believed I was dreaming, a very surreal dream. But this, this was very real! He took his time to sweep thoroughly, cleared the mess his son made in the compound, washed the car, the chores seem endless. My Ibo neighbour is not alone in this revolutionary trend, my Yoruba neighbour (with a pregnant wife) does the same thing. It can be argued that he is handy because of his pregnant wife, but this has been going on since the day they moved in although I always said it was because they were newlyweds. I thought of the mall husbands, the brave men who carry their children while their wives stroll pretty. I won’t lie, I stare at them hoping to see beyond the possible facade they always look so handsome and perfect! 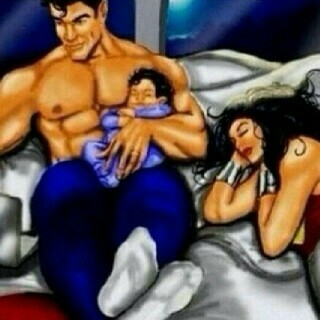 I call modern husbands superheroes because they are! The sound of my baby crying brought me out of my deep thoughts. Hubby will attend to her, I continued my kitchen runs. Haha! It is funny seeing them handle children but it is the cutest sight ever!